The AAJA convention was a huge success and it was a pleasure seeing you all there! During the convention, Sports Task Force recommended ZIRX for your parking needs. If you didn’t have the chance to use it, you’re still in luck! 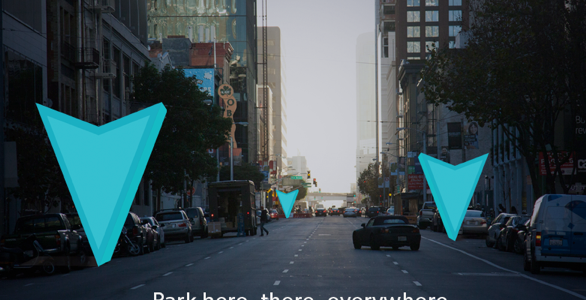 The on-demand parking service may be in a city near you, or somewhere you travel to. Currently the service is based in San Francisco, Los Angeles, San Diego, Seattle, Washington D.C, Brooklyn, and Manhattan. Parking in downtown in these cities is incredibly difficult. This service diminishes the stress of city parking. As mentioned in our previous blog, ZIRX is a local service that will pick up your vehicle at your feet. Download the application on your mobile device, request for an agent to pick up your vehicle, await their arrival, and you’re on your way! ZIRX stores your vehicle in a secure, close-by, garage. When you are ready for your vehicle, get on the app and request an agent to bring it to you. As journalists or media professionals within this industry, being in these downtown areas is quite prevalent. ZIRX offers monthly passes and you can use your pass in ANY of the cities listed above. Other services are also offered in the application such as car washes and oil changes. > Make sure you have all of your belongings and you’re ready to go! Sports Task Force highly recommends this service for all of your downtown endeavors! Reggie Ho inconspicuously walked into the tail-end of an AAJA Sports Task Force meeting to say a few words prior to a screening of an ESPN 30 for 30 documentary based off of his time as kicker for Notre Dame football. I had watched the short film prior to the screening, so I knew what to expect from it: a riveting story about a man who fought his way onto a competitive football team while also studying to be a doctor — and who then succeeded at both. Ho could have said a lot of things to us as he stood up. He could have harped on his personal accomplishments, or he could have given us a light preview of his documentary. Instead, he simply thanked the Sports Task Force for having him and sat down. The brevity surprised me, especially since it was revealed that he had cut his family’s Hawaiian vacation time short to be at the AAJA convention with us. But after the screening, as ESPN anchor Kevin Negandhi conducted a Q&A with Ho, I understood. Every question Negandhi asked, Ho answered respectfully, with pure class and humility. Negandhi even joked about how, at one point, Ho provided a room full of journalists with the classic canned “It wasn’t me, it was the team” answer. It quickly became evident that it wasn’t a canned answer. It was just Reggie Ho being Reggie Ho. The hard work, the discipline, the humility — it propelled Ho to success. He’s now a cardiologist who will forever have his fond memories of kicking for Notre Dame football and winning a title in 1988. A key moment that resonated with me was when Ho recalled how Coach Lou Holtz addressed the team after the championship win. Holtz told them — in the midst of a national championship victory — to remember there was more to life than football. Ho said he was touched that Holtz took a moment to acknowledge that football was just a sport, and that family, God and friends mattered more. The day has come and Sports Task Force is looking forward to seeing all of you! San Francisco is known for difficult parking and STF is offering FREE parking through ZIRX, an on-demand parking service. ZIRX is a local service that will pick up your car right at your feet. All you have to do is get on the application, request for an agent to pick up your vehicle, await their arrival, and you are on your way! They store your vehicle in a secure, close-by, covered garage. Once you’re ready for your car, request delivery and they will bring it back! And just like that, you’re ready for your next destination! Join Us at the 25th Annual AAJA Convention! 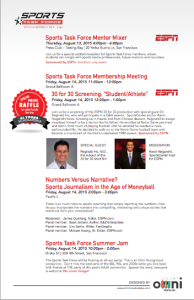 The Sports Task Force will make its organizational debut with members taking part in some exciting events this week! The 25th annual AAJA convention kicks off Wednesday, August 12. Joining the convention will be more than 900 journalists, news executives, media researches and community leaders. After last year’s organizational meeting, STF members have dedicated time and support to channel events that would connect to sports media professionals and students. We are looking forward to providing ways to show that sports news can appeal to a broader audience. The Sports Task Force encourages all to attend the general membership meeting on Friday, August 14, 2015 11:00am – 12:00pm in Grand Ballroom A. The meeting is open to anyone interested in getting involved and connecting with other sports media professionals. This will be a supportive platform where you can share your creative and strategic ideas for STF moving forward as a group. Sports Task Force is incredibly honored to offer college students the Al Young Sports Journalism Scholarship! The scholarship offers up to $2,500 to currently enrolled students who are pursuing sports journalism/media as a career! The Sports Task Force mission is to elevate the voice of Asian Americans in the sports journalism industry across multiple media platforms through programs, mentorship, and scholarship opportunities. Sports are becoming increasingly essential in our lives. Beyond providing entertainment, sports have made headlines and led newscasts across traditional news outlets. There’s a growing need for diverse voices — including Asian Americans in sports media, and the Al Young scholarship is dedicated to support and drive that growth. Scholarship honoree, Al Young is an award-winning journalist who continues to influence many people within the community. He has fostered an interactive dynamic for Asian Americans within the sports journalism field. Across four decades, Mr. Young has been an influential writer and editor at some of the nation’s top news outlets including the Boston Globe, USA Today and New York Daily News. He is also a dedicated past president of the Asian American Journalists Association Washington, D.C. chapter. In 2010, AAJA named Young to its inaugural honor roll as an “Asian American Pioneer in U.S. journalism.” Now retired from the Boston Globe, Young is currently the advisor to the student newspaper at Quincy College (MA). The Al Young Scholarship seeks to support students who embody the values and dedication our honoree has offered the journalism community and media industry for decades. Deadline to apply is October 30, 2016. Once applications are reviewed, a candidate will be selected on the basis of academic achievement, demonstrated journalistic ability, financial need, and commitment to the field of sports journalism. AAJA student membership is required for the selected scholarship recipients. For membership application, please apply online at www.aaja.org. Applicants must demonstrate journalistic excellence and a strong interest in pursuing sports journalism as a career. Selected scholarship recipients must commit to a minimum of five hours of volunteer work for the AAJA Sports Task Force. Applicants must be an undergraduate enrolled with at least 12 credit units per semester at a junior college/university within the United States. Applicants must be enrolled in or on track to take journalism courses.